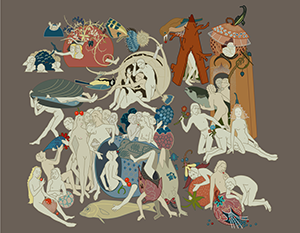 The Garden of Earthly Delights 2050 — A vector graphic interpretation of five scenes form the central panel. I am currently working on the graphical interpretation of classical artworks into logo’s shapes and lines, reducing the original image to its minimal elements. The Garden of Earthly Delights 2050 begins this series. The Garden of Earthly Delights by Hieronymus Bosch is an apology on pleasures where a crowd of naked men and women abandon themselves to all kinds of entertainment, amid birds and giant fruits. It’s an analogy of our today way of life: rather than looking at the terrible effects of overpopulation on the resources of the planet and the survival of humanity, the human race chooses to ignore the warning signs and focuses on trivial actions.